Continuing MSNBC's sad tradition, Maddow first attacked one of the convention's speakers: "The opening speech last night was given by failed presidential candidate, ex-congressman and professional anti-immigrant, Tom Tancredo who started the event off with a bang, a big loud racist bang." 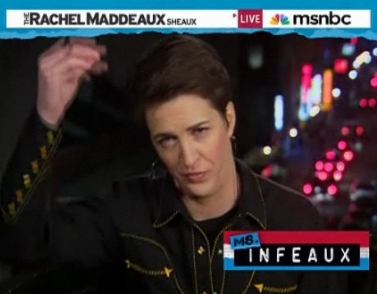 RACHEL MADDOW, HOST: But first, a couple of holy crawfish stories in today`s political news. The much-maligned national tea party convention is underway today in Nashville. This is the one that is for profit. Tickets cost over $500. Described as "something that smells scammy" by right-wing Web site, "Red State," the convention lost many of its sponsors and two members of Congress due to speak at the event. Republicans Michele Bachmann and Marcia Blackburn pulled out. Sarah Palin is still due to address the confab tomorrow. She`s reportedly being paid a six-figure speaking fee to do so. The opening speech last night was given by failed presidential candidate, ex-congressman and professional anti-immigrant, Tom Tancredo who started the event off with a bang, a big loud racist bang. FMR. REP. TOM TANCREDO (R-CO): Mostly because I think we do not have a civics literacy test before people can vote in the country, people who could not even spell the word, "vote," or say it in English, put a committed, socialist ideologue in the White House. The name is Barack Hussein Obama. MADDOW: Just for reference here, when Tom Tancredo talks about literacy tests, that`s what they used in the south to keep black people from voting before civil rights legislation and court rulings put a stop to that. So the convention opened with a clarion call to bring back the literacy tests for voting. And as you could hear, the tea party convention crowd erupted in cheers at the suggestion, although, to be fair, it was sort of hard to tell exactly what the sounds coming from the crowd meant. They were sort of a little bit muffled by, you know, the white hoods. Maddow was playing a little fast and loose with the facts here. After all, the federal government first used literacy tests as part of an immigration policy enacted in 1917. It is of course correct that literacy tests were used in the south to prevent blacks from voting. However, as Tancredo's hot-button issue is indeed immigration, it's absurd to link his statement Thursday evening to racism. After all, he referred to "people who could not even spell the word, 'vote,' or say it in English." That's an immigration issue. 1. How many stripes are there on the U.S. flag? 2. Who is the chief justice of the Supreme Court today? 3. In what year was the Constitution written? 4. Which of these is guaranteed by the First Amendment? 5. How many Supreme Court justices are there? 6. What are the first 10 amendments to the Constitution called? 7. When was the Declaration of Independence adopted? 8. Which of the following amendments to the Constitution does NOT address or guarantee voting rights? 9. What are the 13 original states? Connecticut, New Hampshire, New York, New Jersey, Massachusetts, Pennsylvania, Delaware, Virginia, North Carolina, South Carolina, Georgia, Rhode Island, Maryland, Washington, D.C.
10. What do the stripes on the U.S. flag mean? 11. What is the introduction to the Constitution called? 12. How many changes or amendments are there to the Constitution? 13. Which of the following is NOT one of the constitutional requirements to be eligible to become president? 14. Who selects the Supreme Court justices? 15. How many representatives are there in Congress? 16. Who said, "Give me liberty or give me death"? 17. Why did the Pilgrims come to America? 18. Who has the power to declare war? 19. What INS form is used to apply to become a naturalized citizen? Form N-200 "Petition for Naturalization"
20. Which of these contains three rights or freedoms guaranteed by the Bill of Rights? So, Ms. Maddow, if it's not racist for the U.S. government to expect immigrants to answer these questions, is it racist to want voters to AT LEAST be able to spell the word "vote"?